My new book,?The Wine Trials (Fearless Critic Media, 208 pages, paperback, $14.95, distributed by Workman Publishing), has been released. It’s now available on amazon.com, at Whole Foods Market stores nationwide, and at bookstores everywhere. 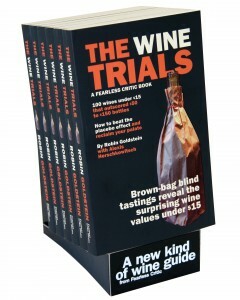 For more information, check out the Wine Trials website, which includes reviews, media coverage, the full text of the first chapter, and a video of our blind tastings.